There are days when I look at Turner and think, "Wow, he looks like such a big kid." Where did the time go? My first born will be five soon, and before I know it he will be driving off to college : (. 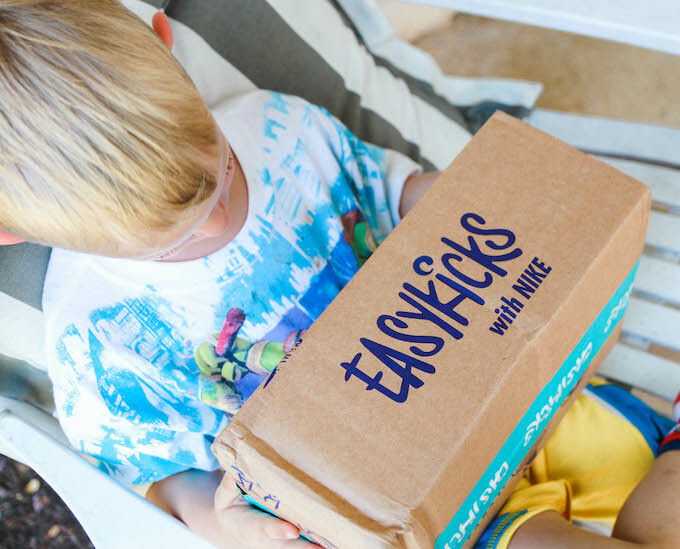 I'm sharing a look in to life with a 4 year old boy and an awesome subscription box from Easy Kicks for your sneaker loving kids! He's very similar to his mama, as he loves hard and fights hard. When I was a child, my Dad could look at me the wrong way and I would immediately start crying. I am very sensitive and so is Turner. It makes him the sweetest boy, but when he freaks out he FREAKS out! What does he freak out about? Shoes. Shoes have always been his favorite thing. I promise I didn't push this, he naturally always loved sneakers. 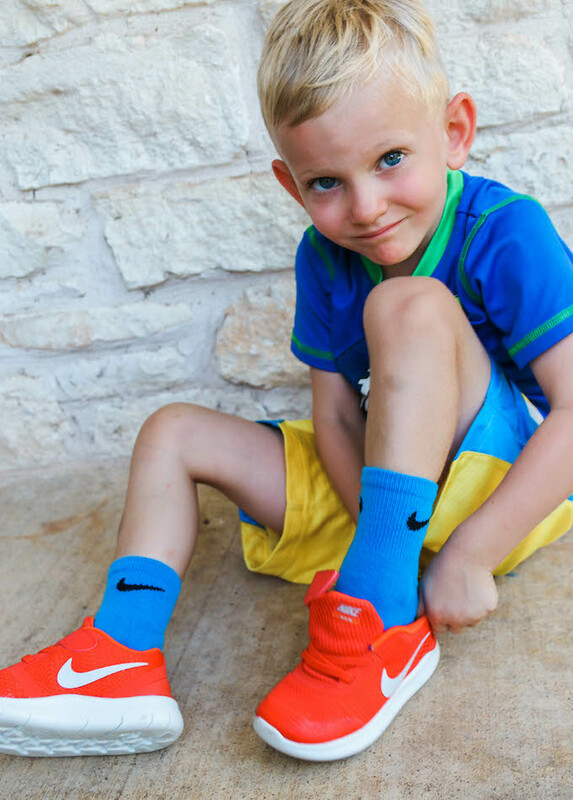 From a young age he would request to wear his Nikes. As he grew older socks became a whole new issue, as the front seam bothered him. I know it's payback because my mom told me I freaked out about the same thing as a child. Some mornings are better than others, but during the tough times a deep breath and a hug with Alex helps. A few weeks ago I discovered a new to me subscription service called EasyKicks on Instagram and immediately reached out. You pay $20 a month and your child gets a new pair of Nikes or Converse! 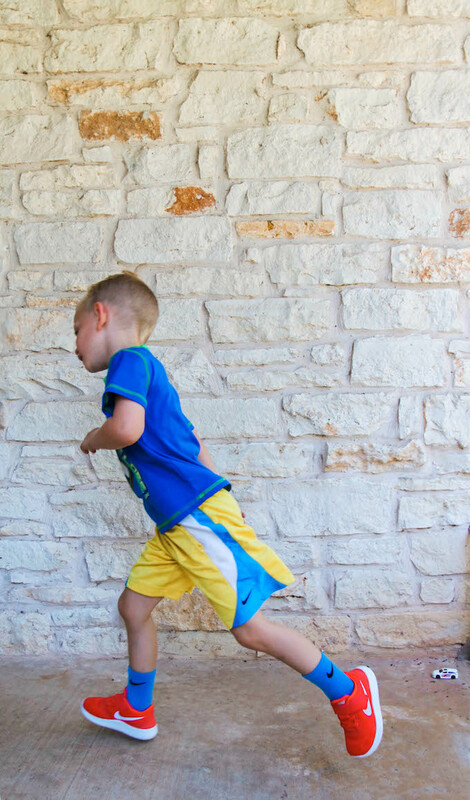 Our children's feet are constantly growing so EasyKicks is the perfect way to trade out their old shoes for a fresh new pair! Once you make an order, shoes will be shipped to you in a personalized mailer with a return bag. Once you have worn out your first pair of EasyKicks, stick them in the return envelope and drop them in your mailbox. Once you have dropped your worn pair of EasyKicks in the mail, it's time to pick a new pair. Browse the frequently updated kicks collection, complete with Nike and Converse shoes. When you are ready, send back your old pair and start with another fresh style. Swap them out, based on the right cadence for your child. $20/month to keep going forever. Right after Turner saw his new shoes he immediately had to change in to a "FAST" outfit so he could test them out. Cue the outfit change, but what's new. This kid changes clothes at least 4 times a day when we're home. EasyKicks has a great selection of sneakers to choose from and sizes run 4c to 7y! I learned my lesson with Turner when he was young, but I usually only buy shoes that have velcro straps making it simple for him to put them on himself. He chose the Nike Free Run in orange. 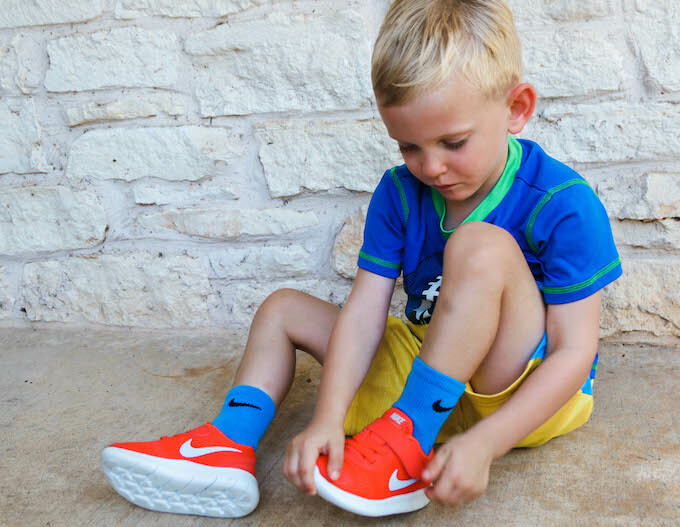 After returning your shoes, EasyKicks will either donate them to a child in need or recycle them into playgrounds and sports fields through Nike Grind if they are trashed. How cool is that?! I love this idea because Turner goes through shoes FAST, and $20 is affordable for a quality pair of sneakers. 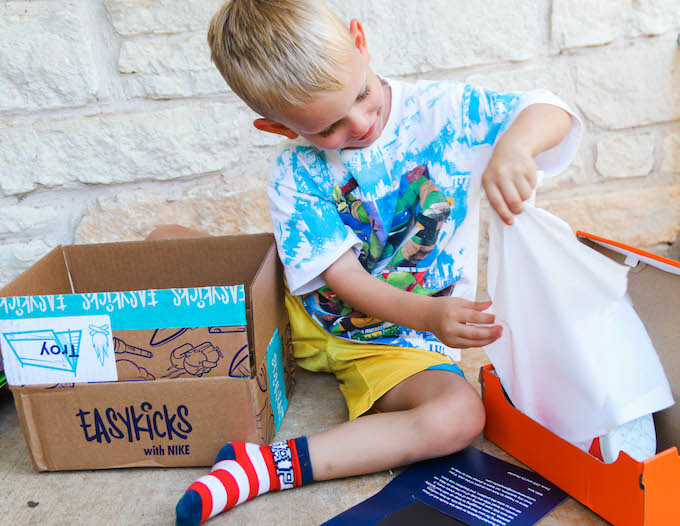 Find out more about EasyKicks subscription box here! Recently I've noticed Turner's personality really come out in group settings. Whether he is around kids or adults he's usually the goofy entertainment. His teacher said he is the class clown...hmm I wonder where he gets it from? I was voted class clown my senior year ; ). Shine on #TurnerJack! This post was sponsored by EasyKicks but all thoughts and opinions are my own. 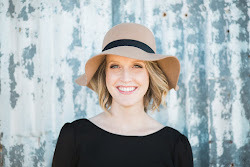 Thank you for supporting the brands I love!